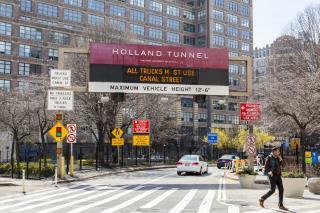 (Newser) – Police say a cache of weapons has been found inside a van that was stopped at the Holland Tunnel, which connects New Jersey to New York City, the AP reports. No link to terrorism is suspected. Two men and a woman in the van were taken into custody. It wasn't immediately clear what charges they may be facing. Subsequent search after noticing a cracked windshield. Because a minor vehicle defect is always reasonable grounds for a search, drug dogs, bomb detectors. Imagine if they'd had a busted tail light.